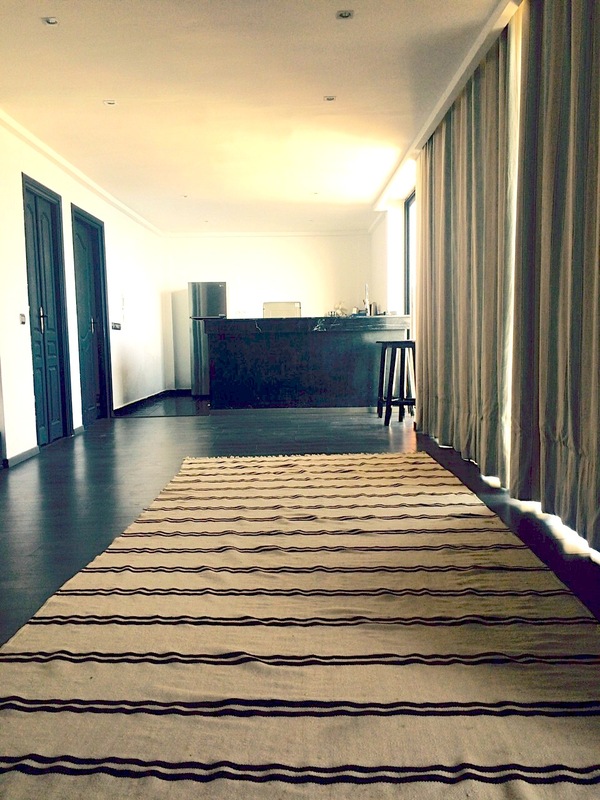 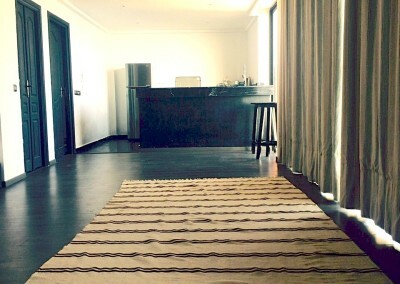 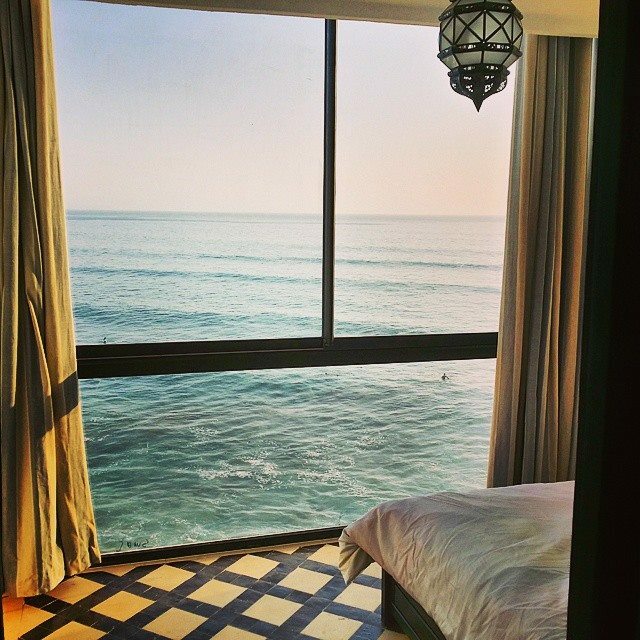 Think You Might Like To Stay Here? 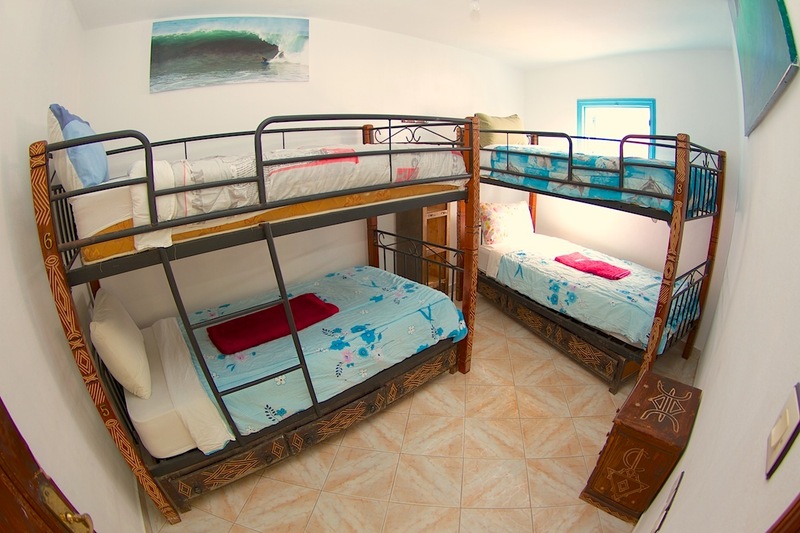 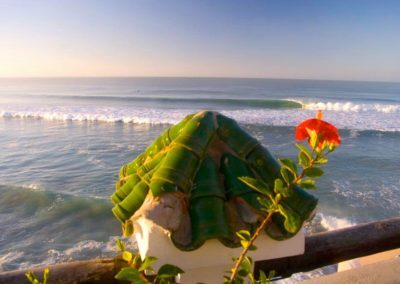 Staying in the surf camp is a great way to get to know the area, meet lots of fabulous and friendly guests and learn to surf. 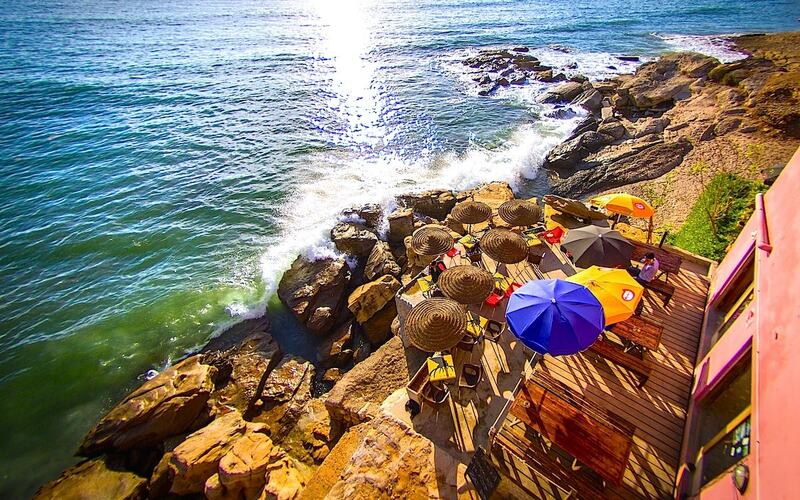 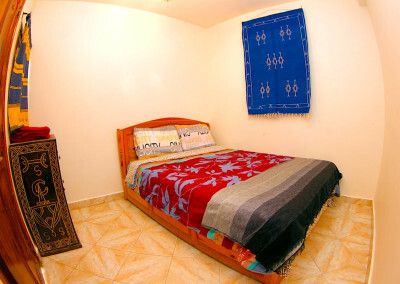 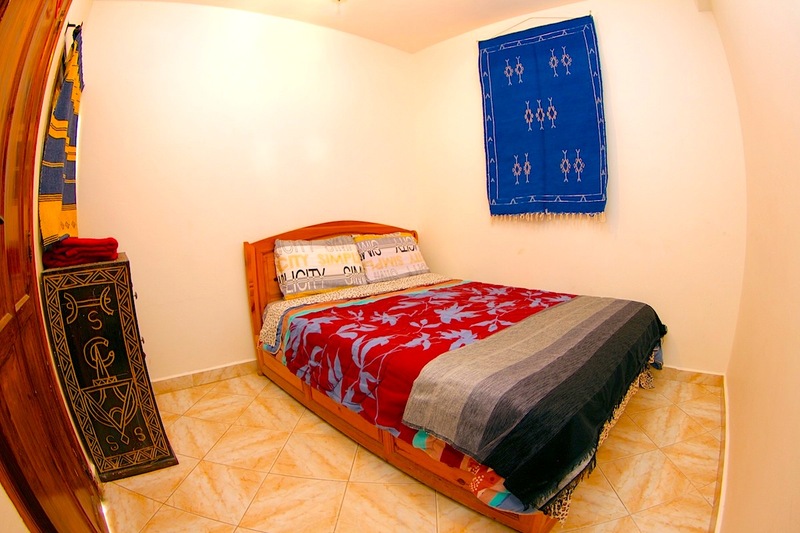 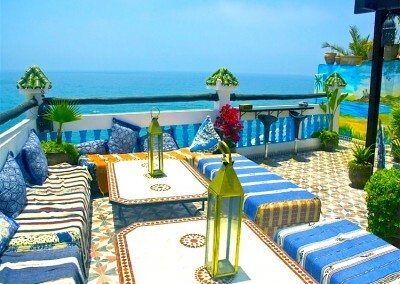 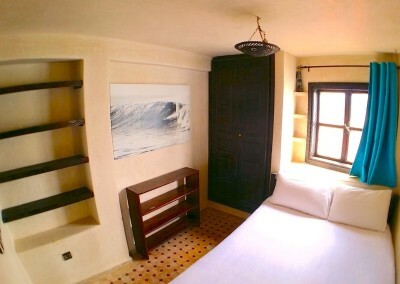 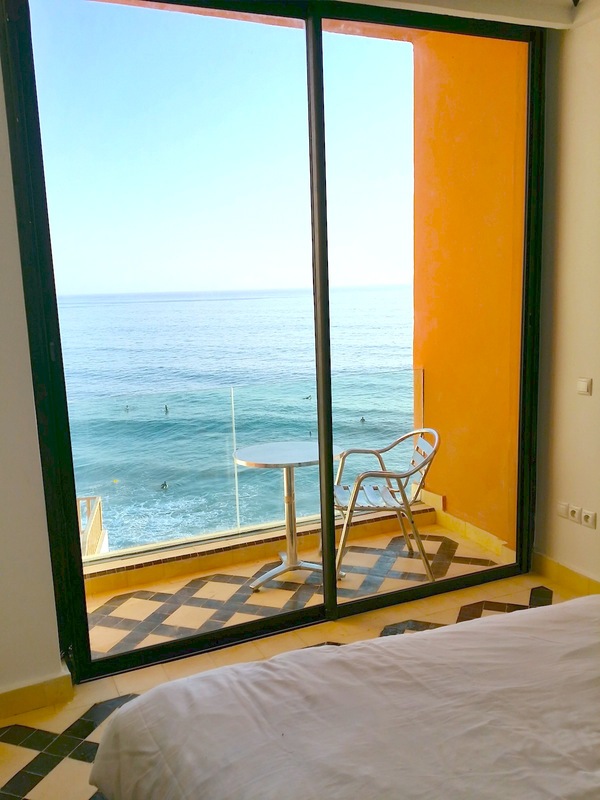 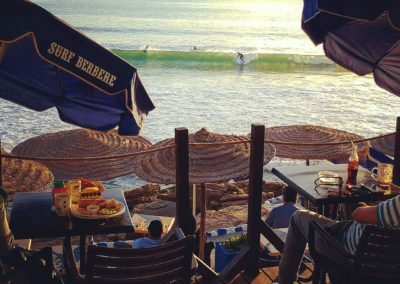 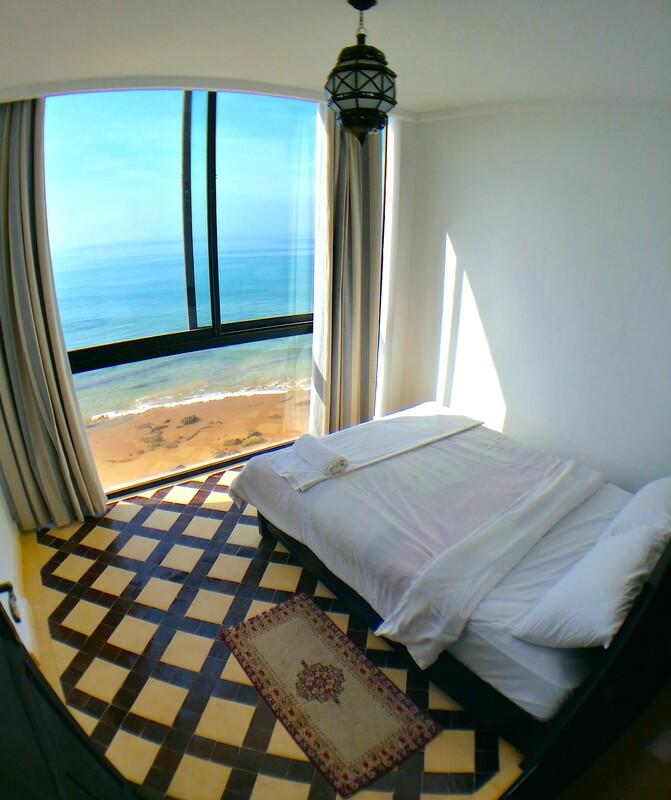 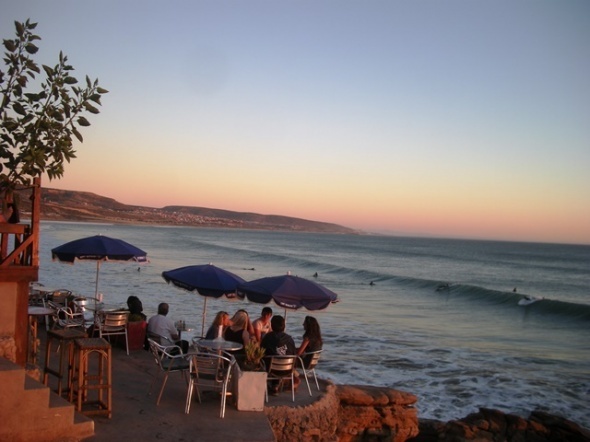 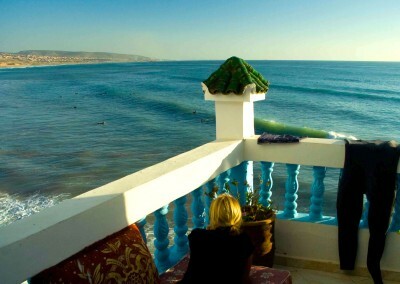 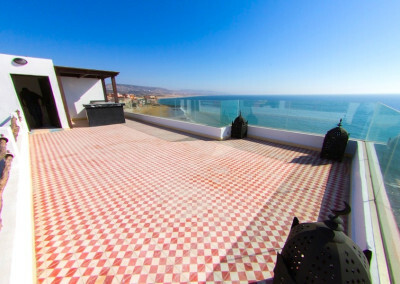 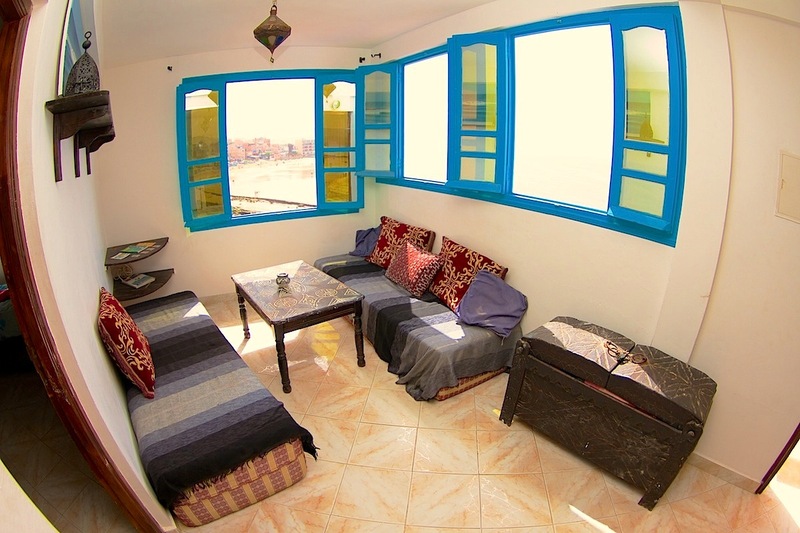 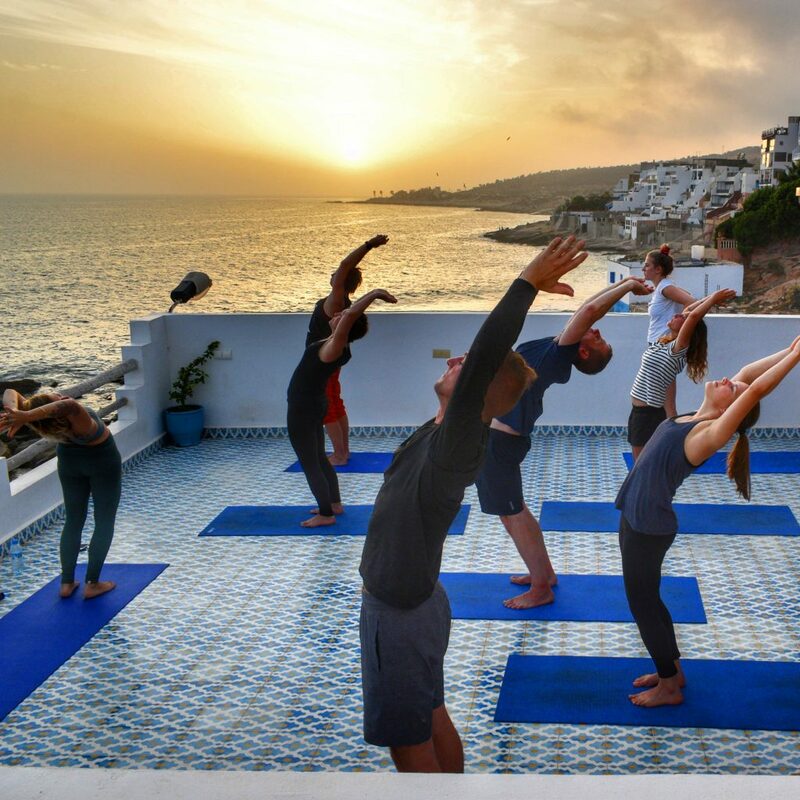 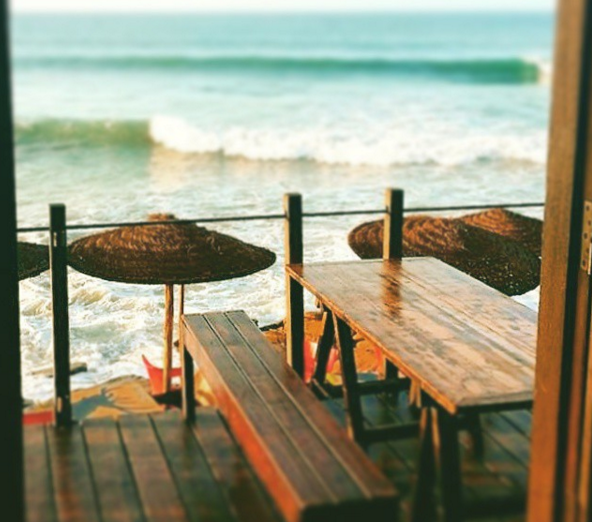 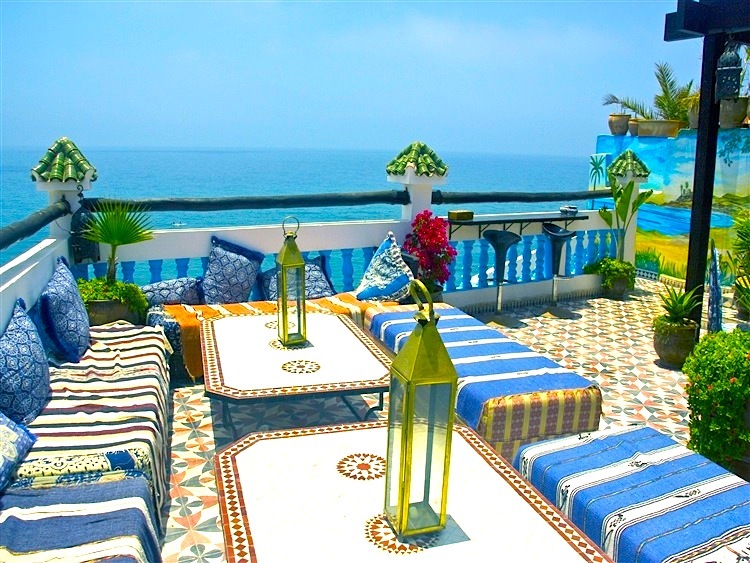 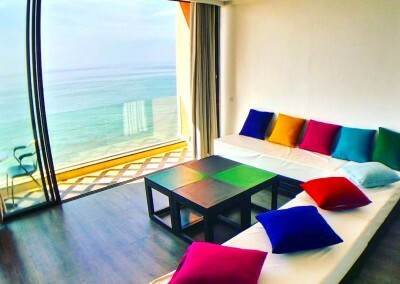 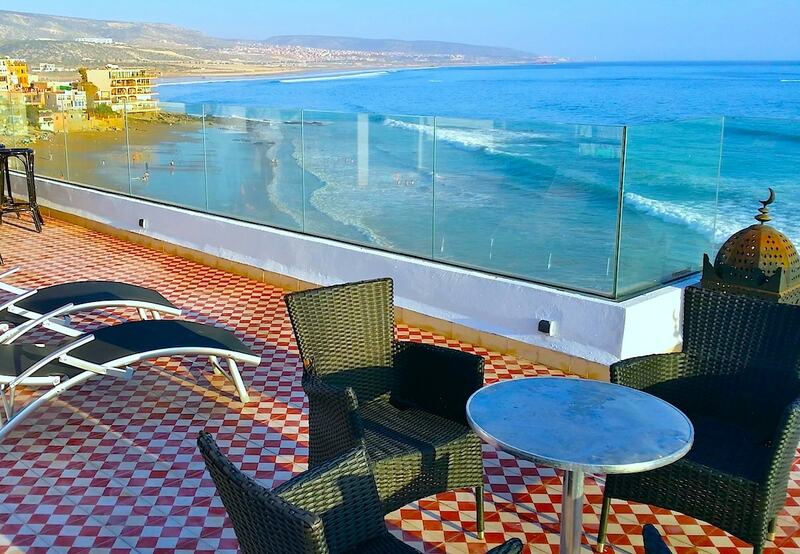 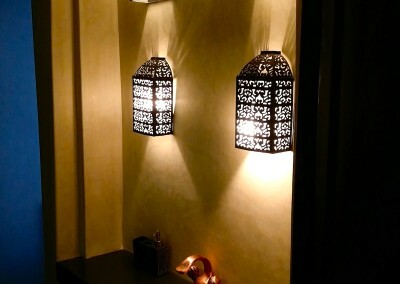 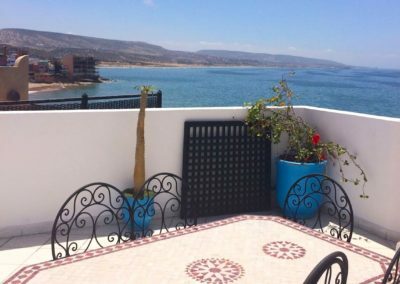 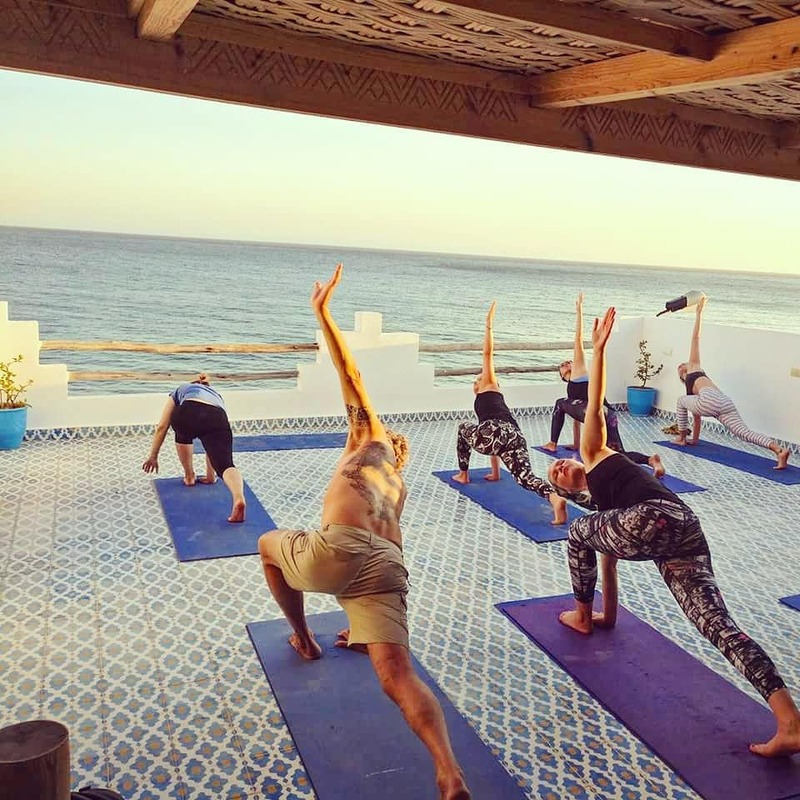 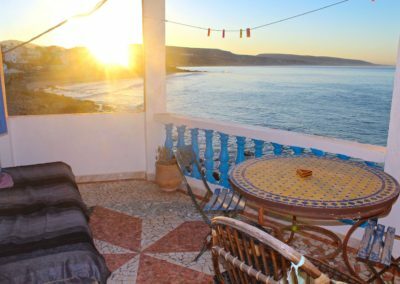 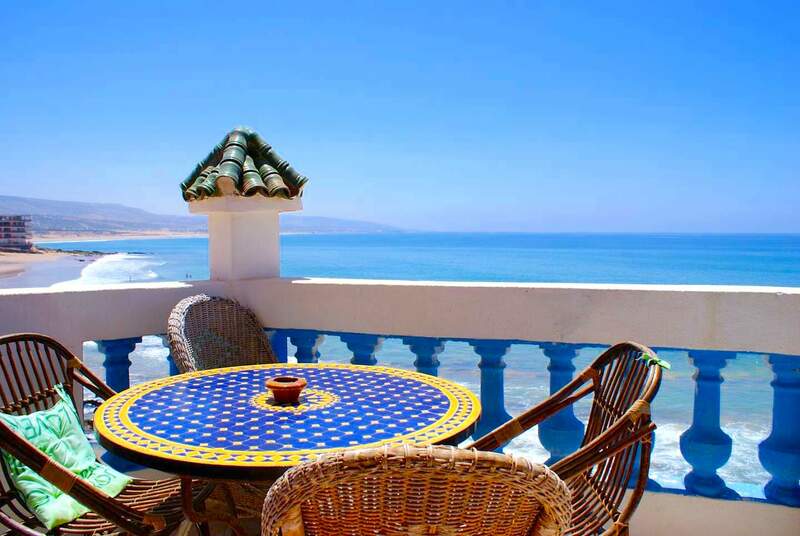 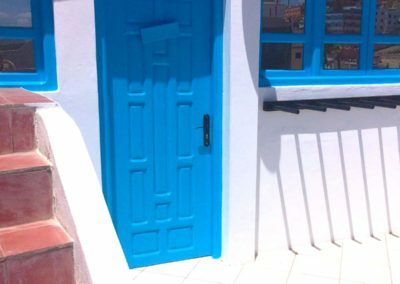 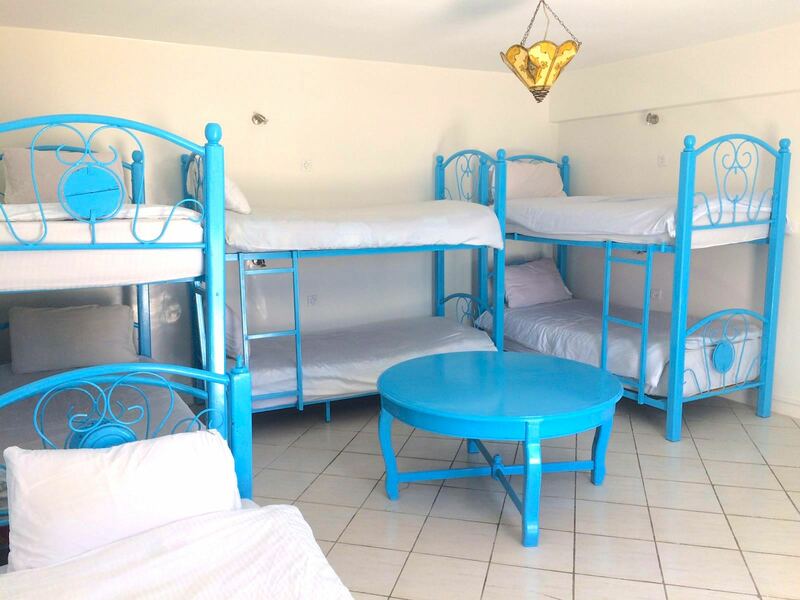 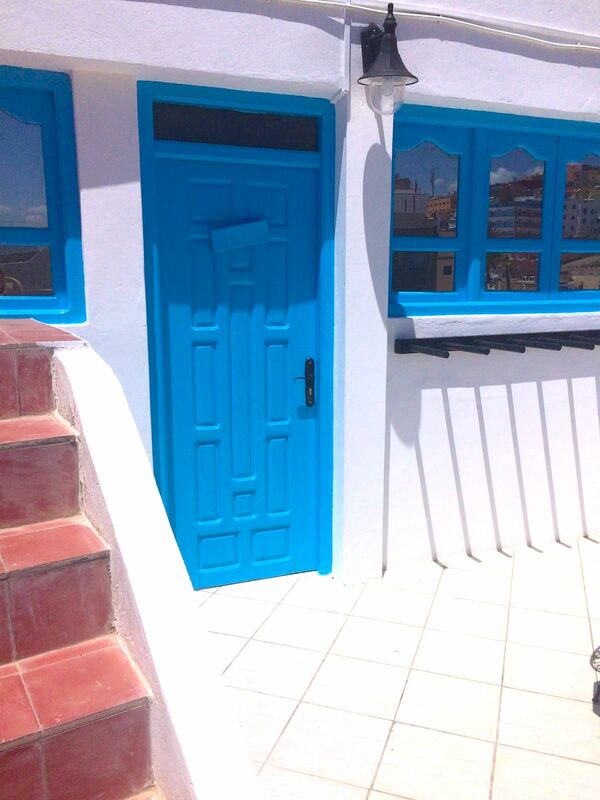 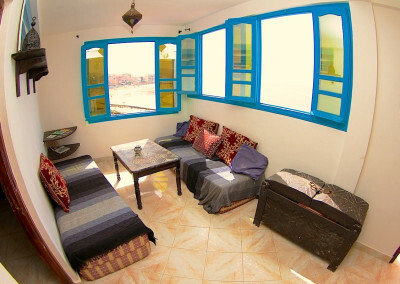 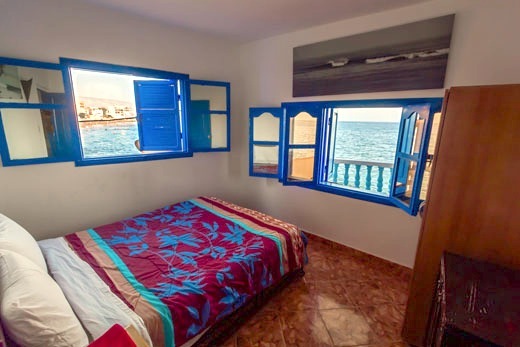 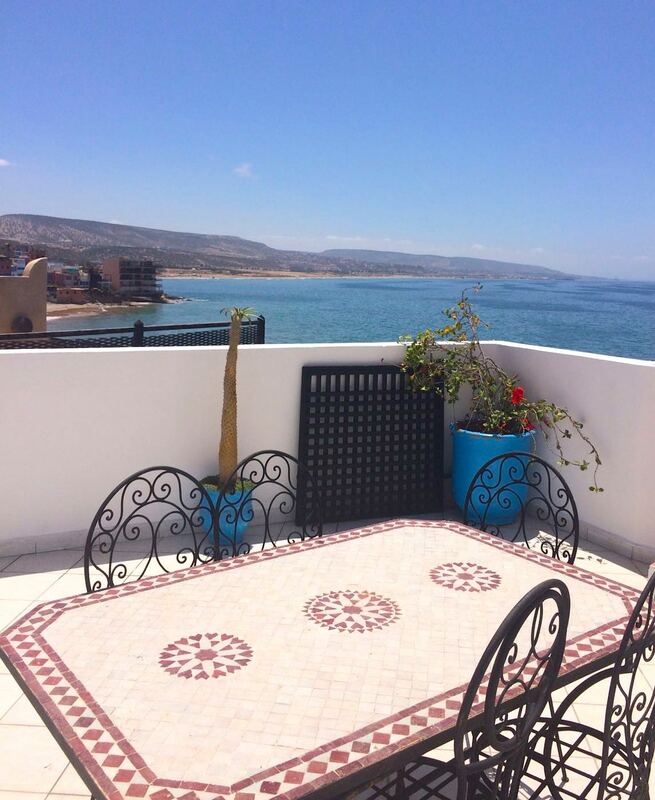 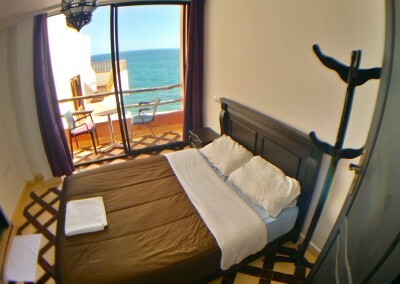 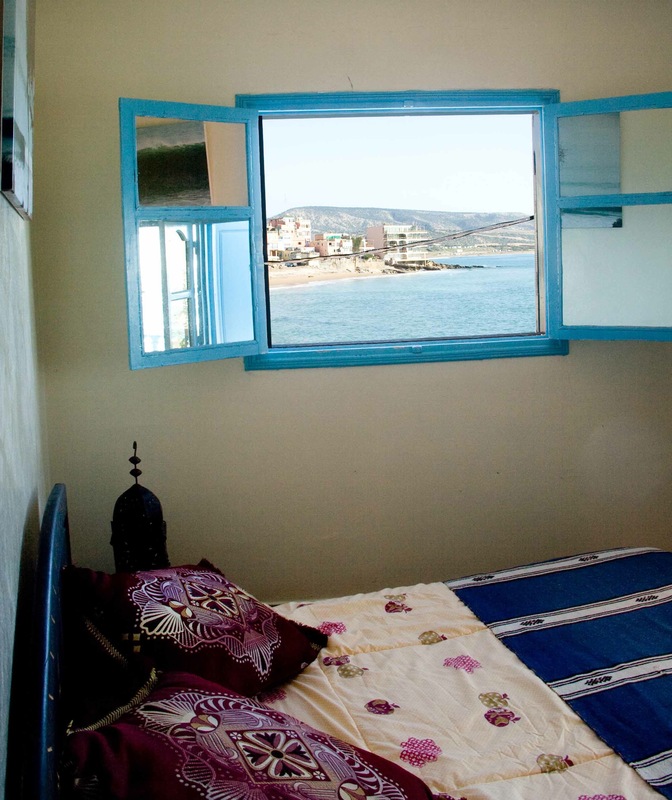 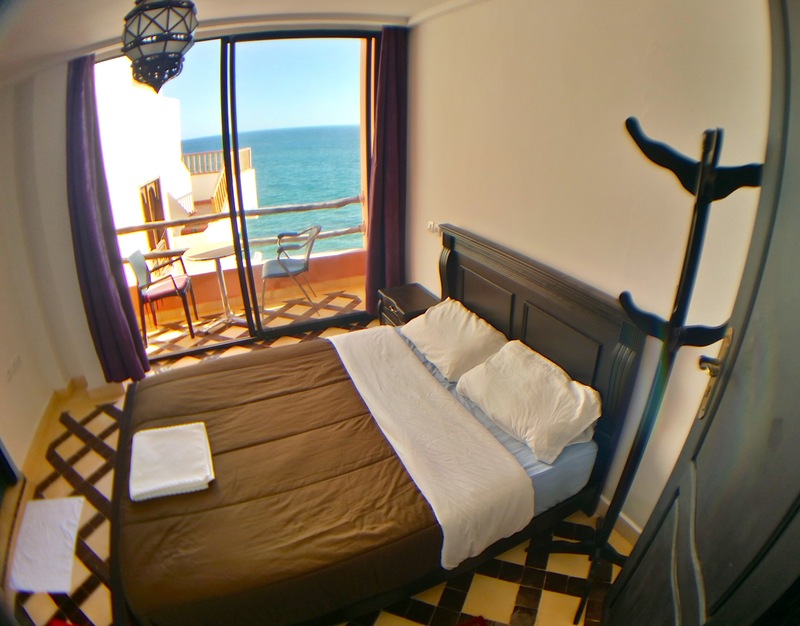 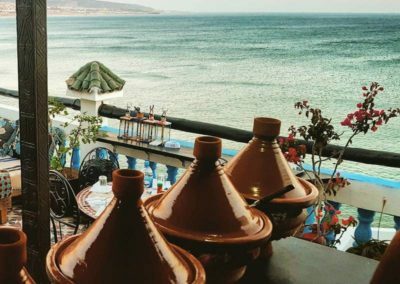 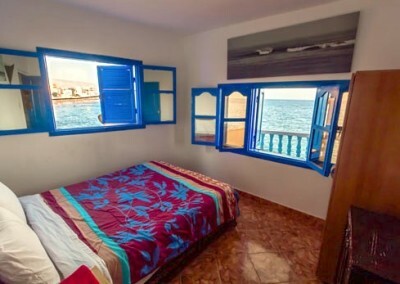 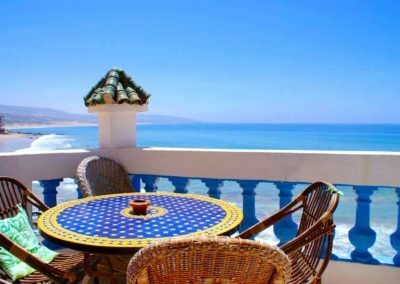 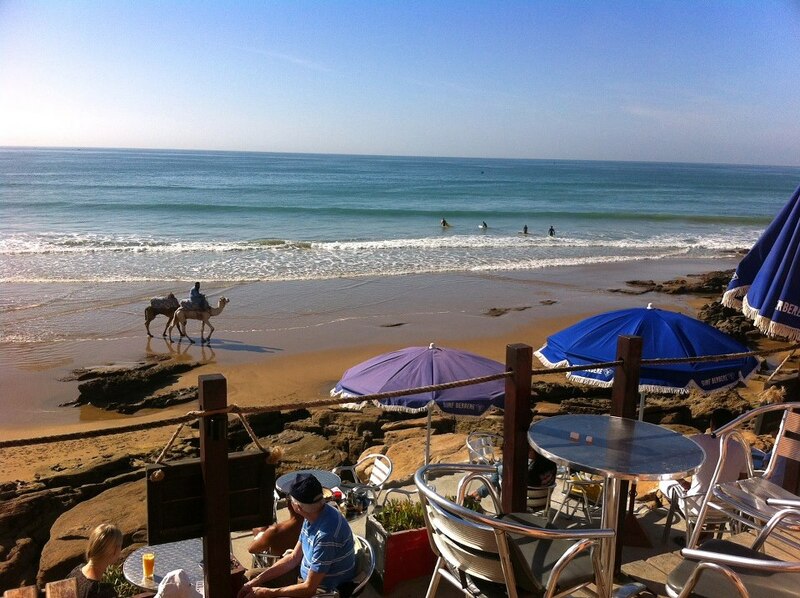 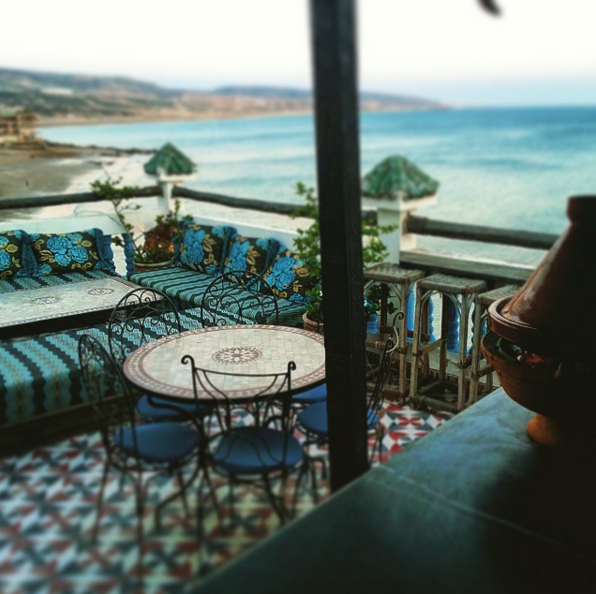 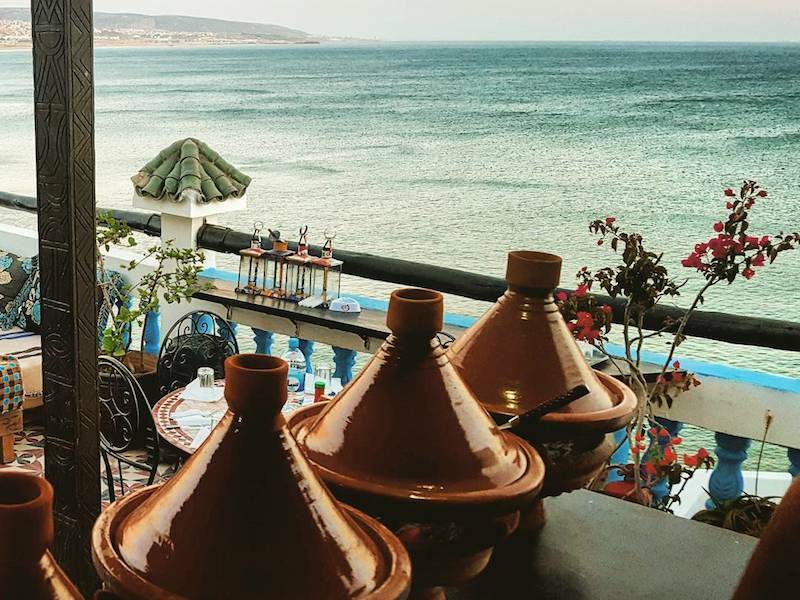 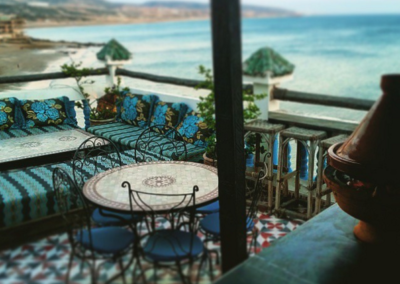 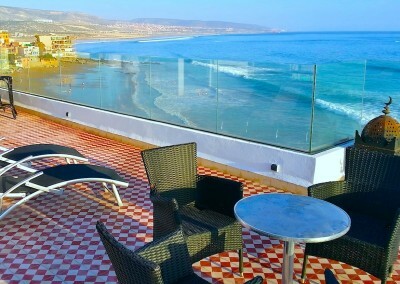 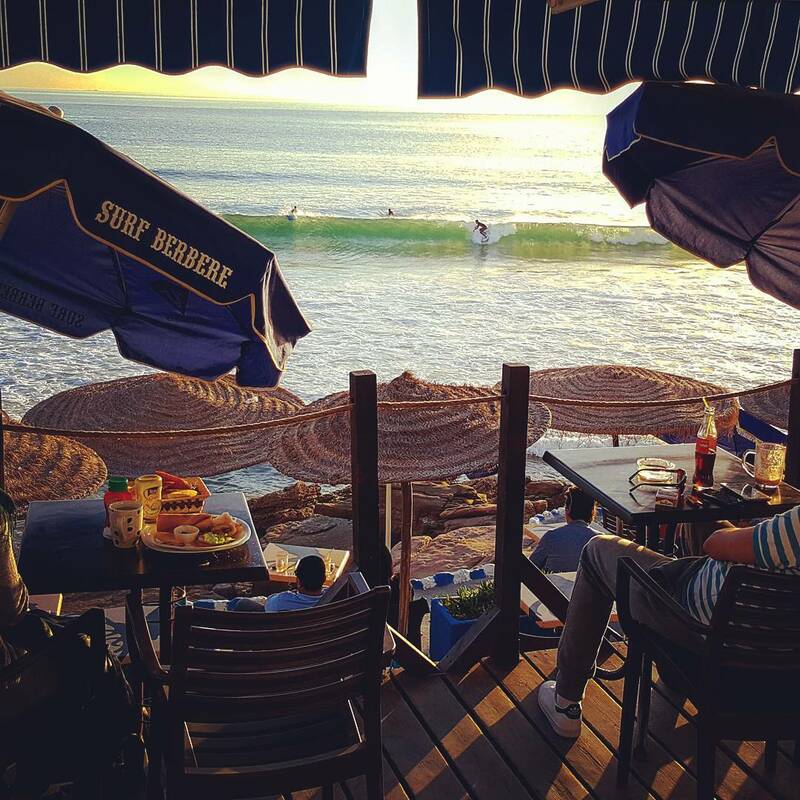 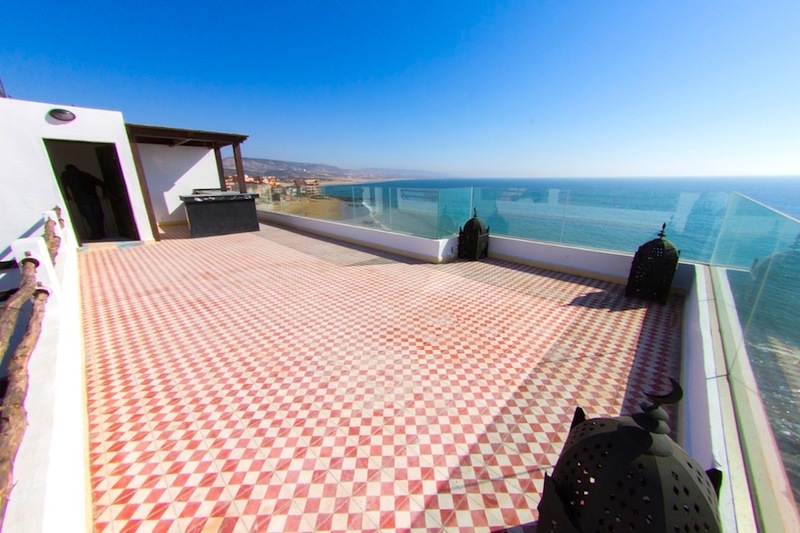 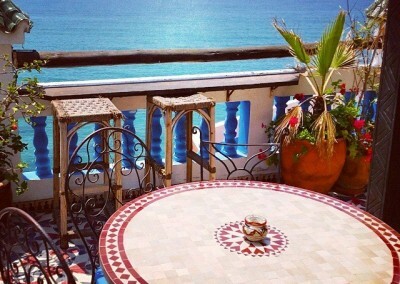 Life is made easy if you are staying in our Taghazout surf camp, because we have everything you need starting from a hearty breaky in the morning at the cafe, followed by an action packed day of surfing, then in the evening you get to relax and unwind with some yoga and a 3 course dinner. 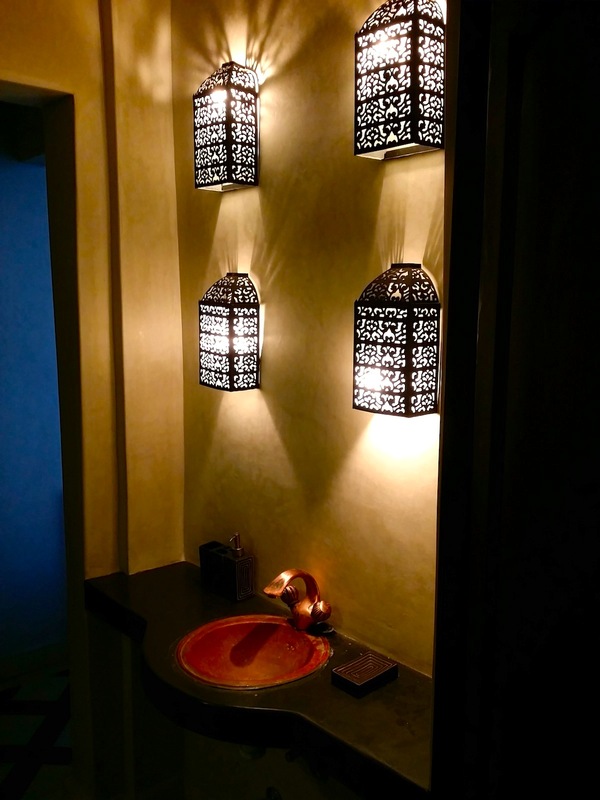 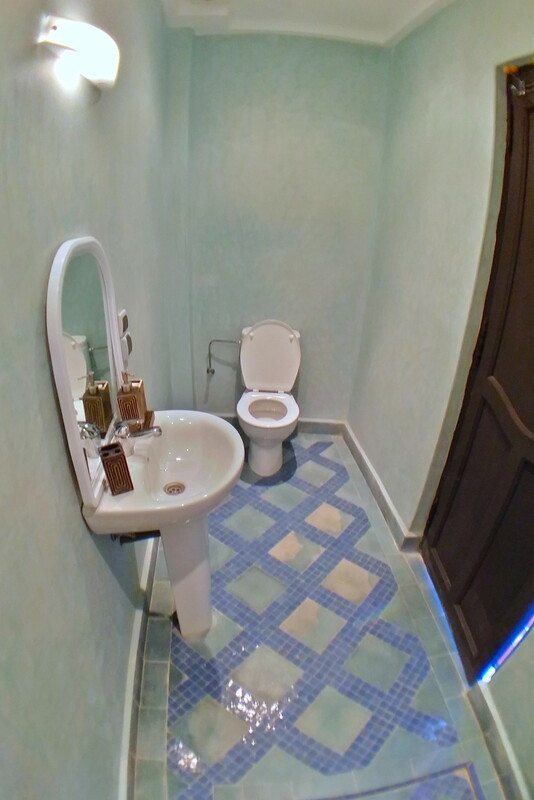 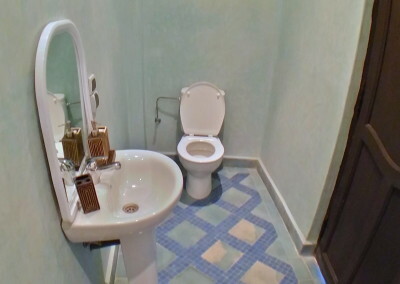 Sometimes you fancy a bit of luxury, sometimes you want a bit more privacy and space. 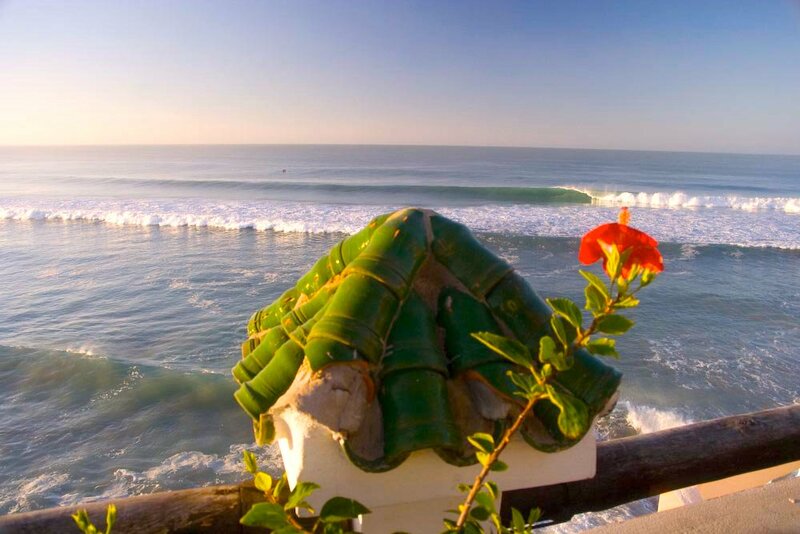 Sometimes you already know the area and just want to hire a car and get out surfing on your own terms. 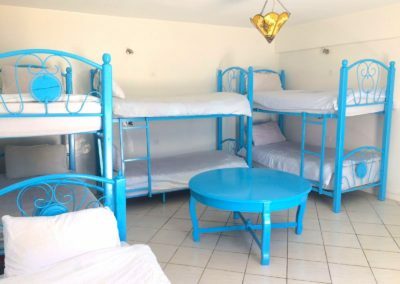 We understand that and the Boaud apartments are the perfect base for more independent people or those just wanting a bit more of their own space. 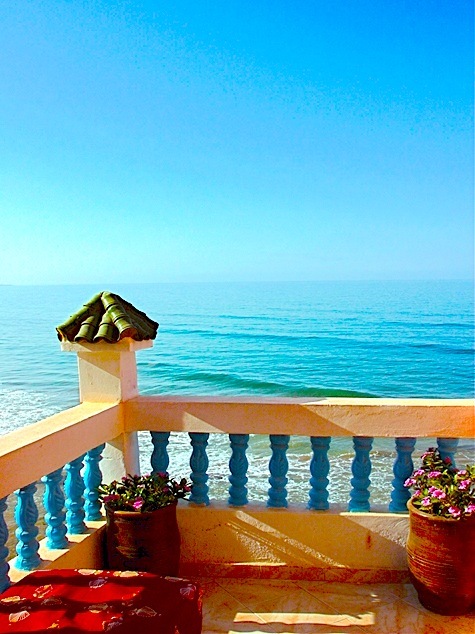 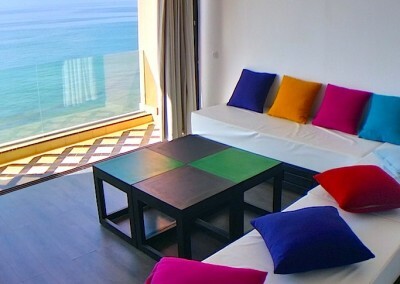 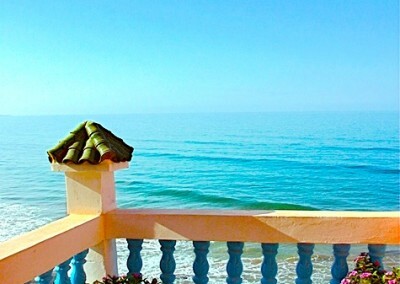 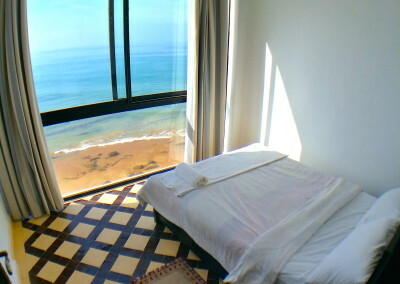 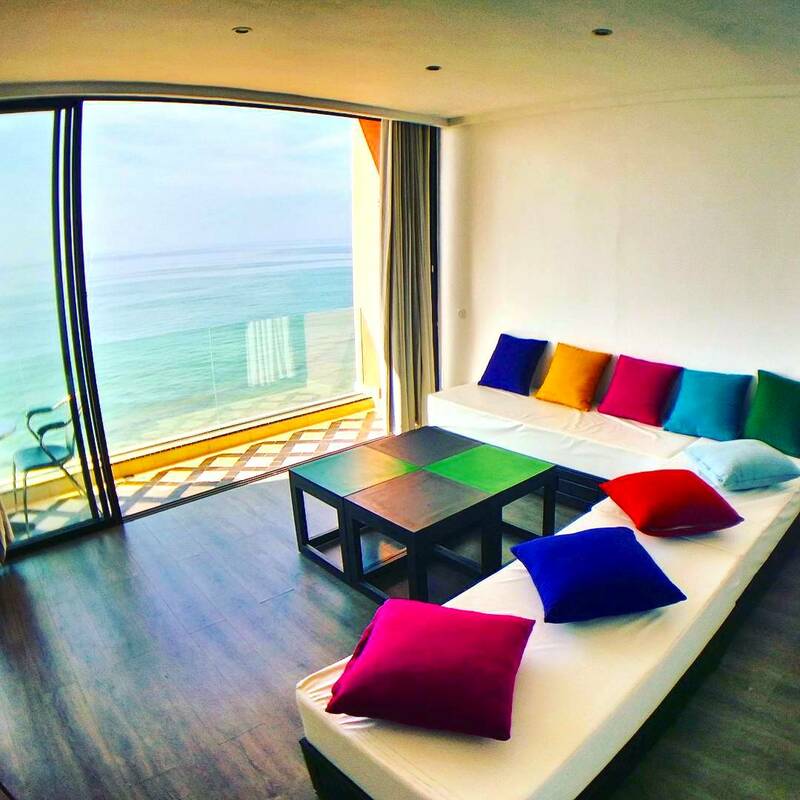 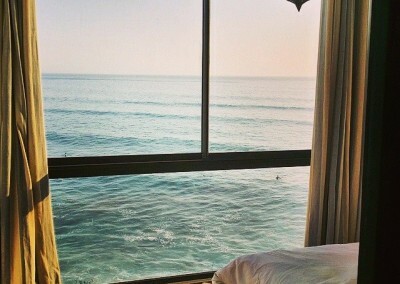 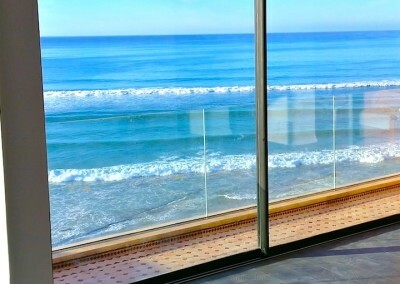 Floor to ceiling views of the ocean, what’s not to like! 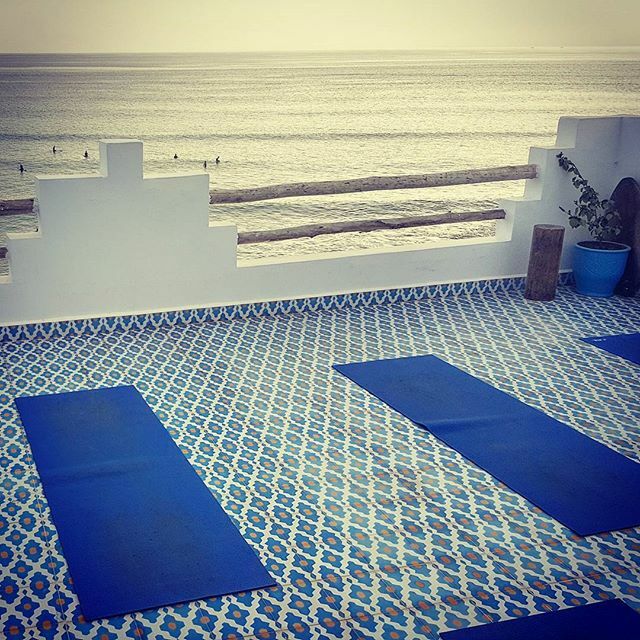 Doing yoga with nothing but the sky to look at is an amazing holistic experience. 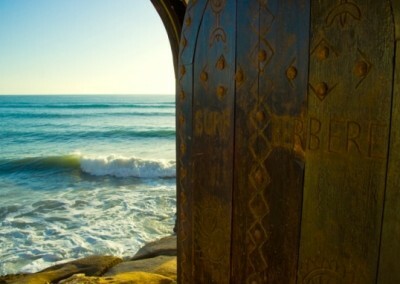 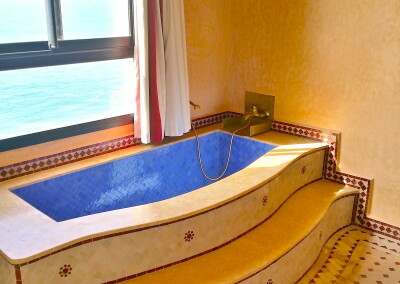 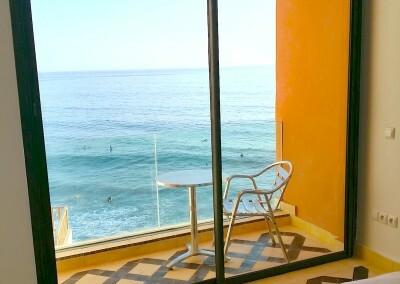 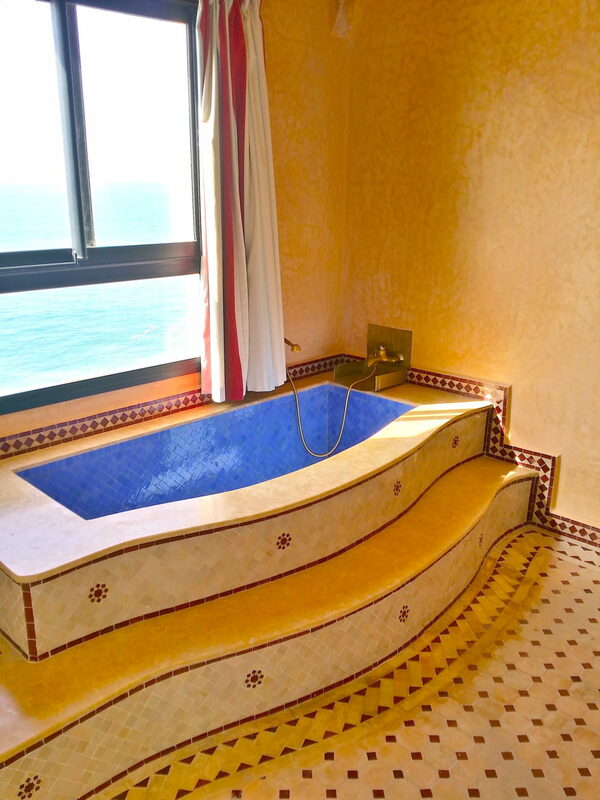 Watch the waves roll in as you stretch and relax after a day of surfing. 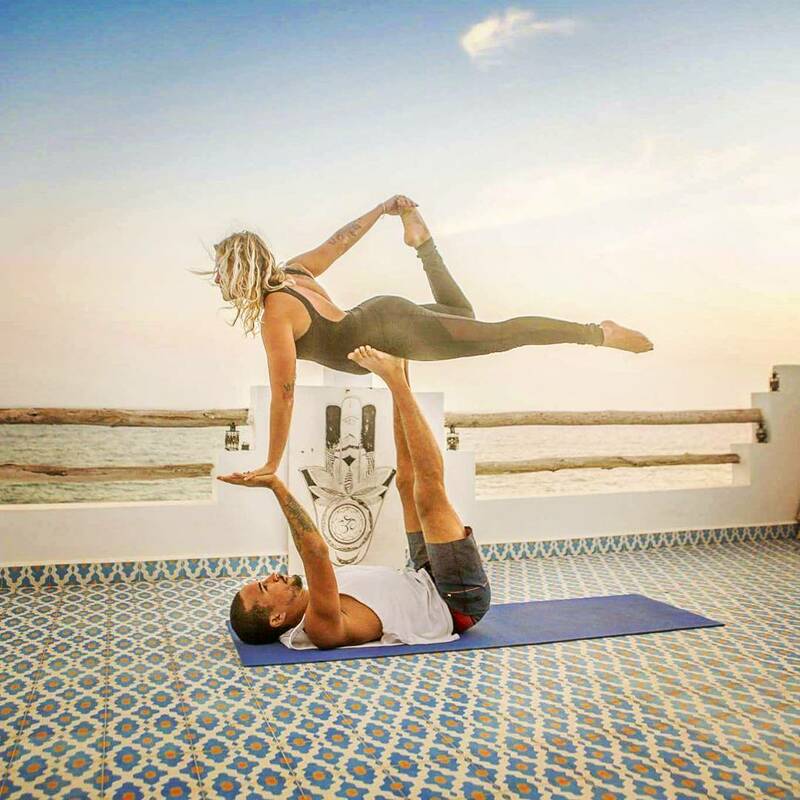 We don’t do cramming in, we limit classes to 16 people and ensure that you get the attention and space that you need to be able to fully relax and engage in our yoga class. 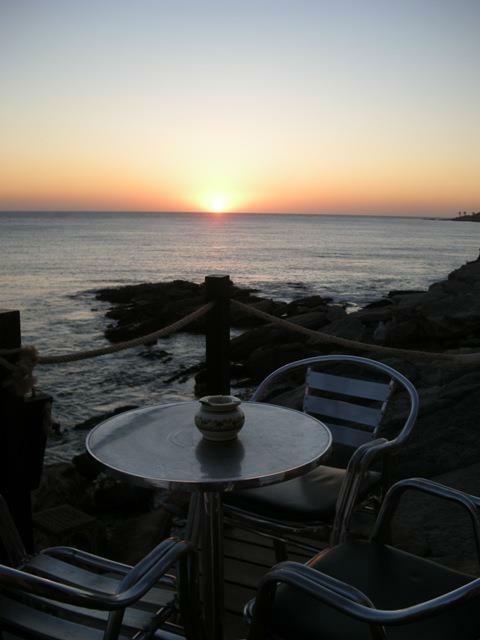 Cafe KR has become one of the best known restaurants in the whole region on the back of a simple menu of fresh fish and calamari and a stunning location on Hash Point. 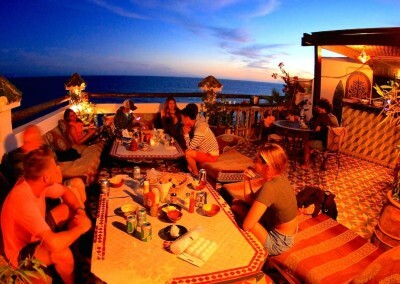 People come to the cafe every evening to watch the sun set over Anchor point and the surfers out front, riding meters from the Hash Point rocks. 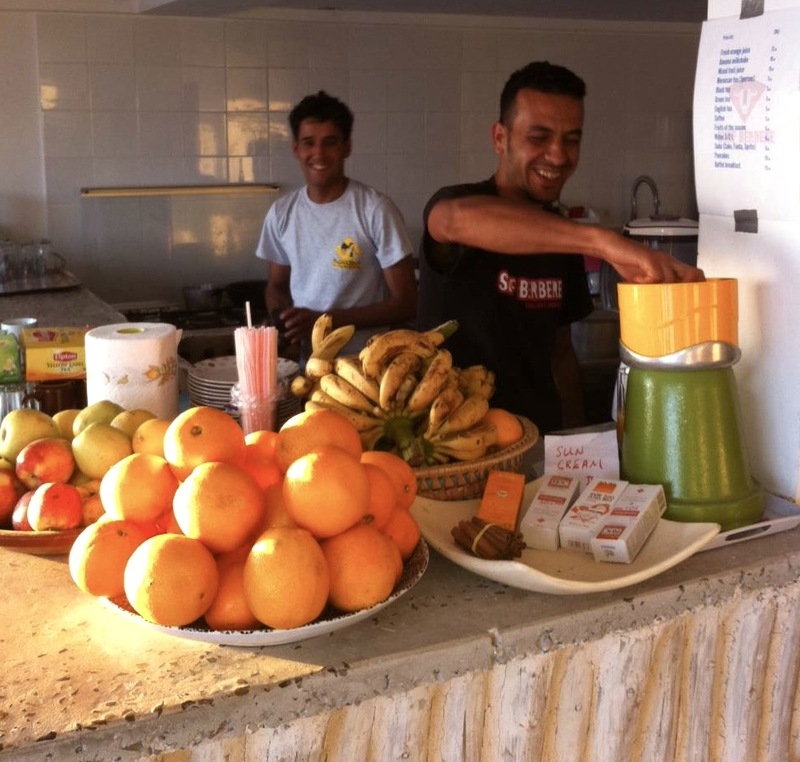 Local tip: ask for a nus nus, half half coffee! 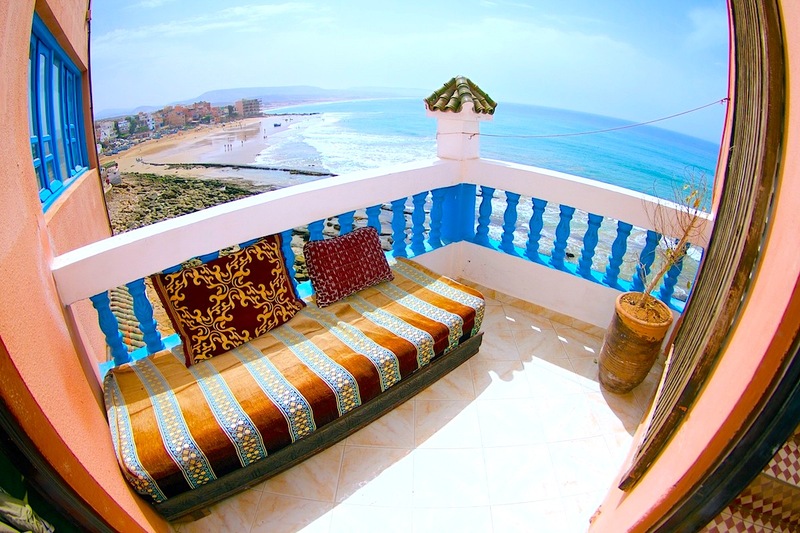 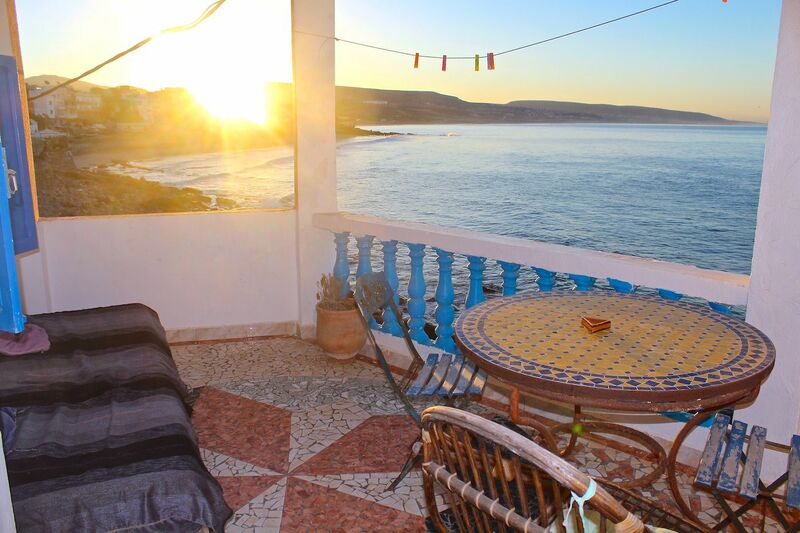 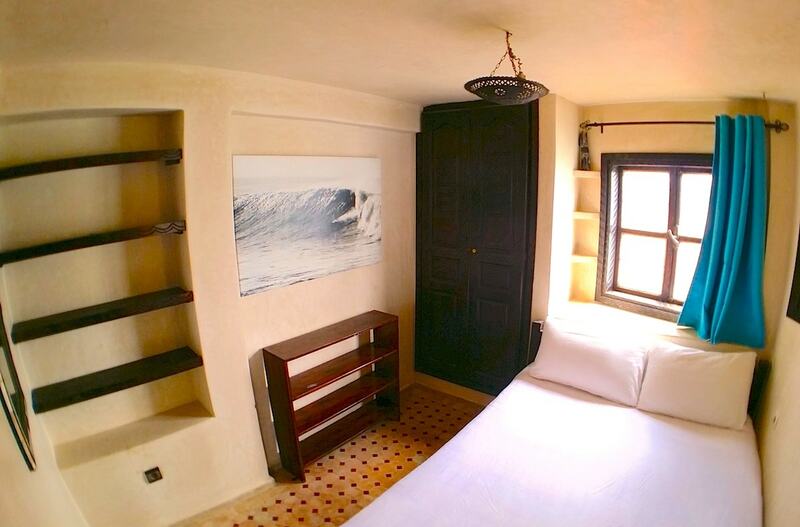 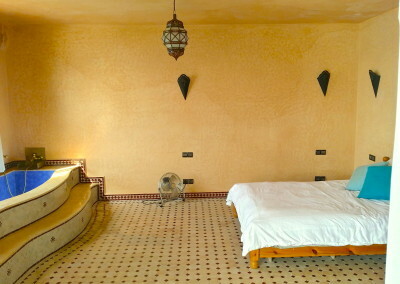 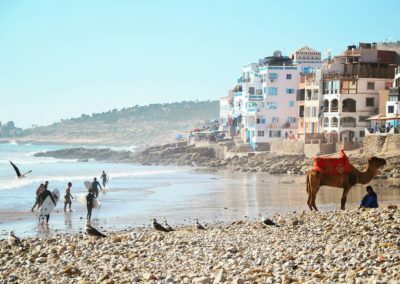 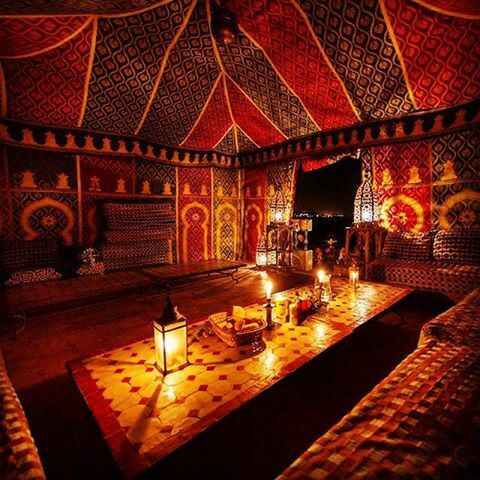 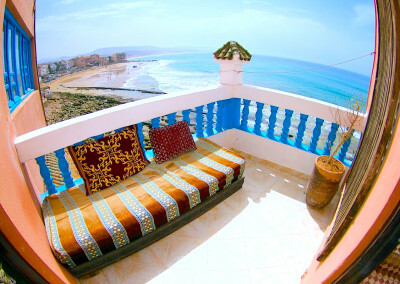 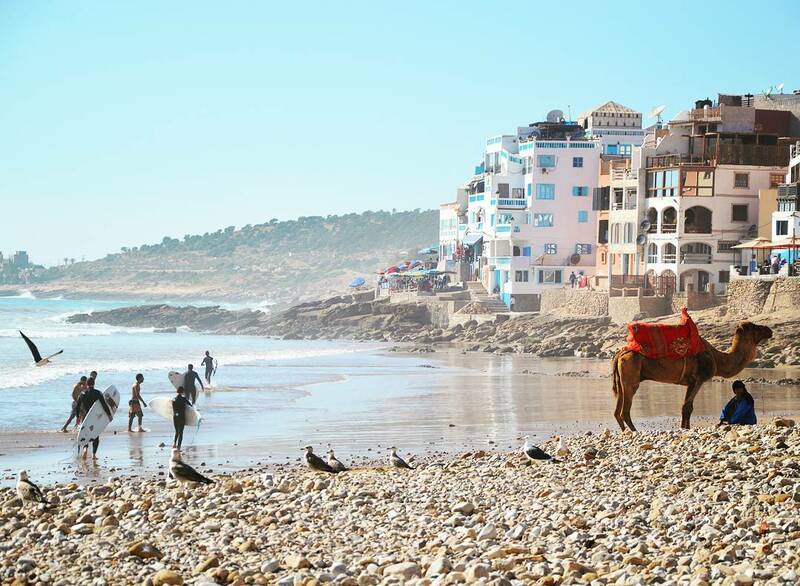 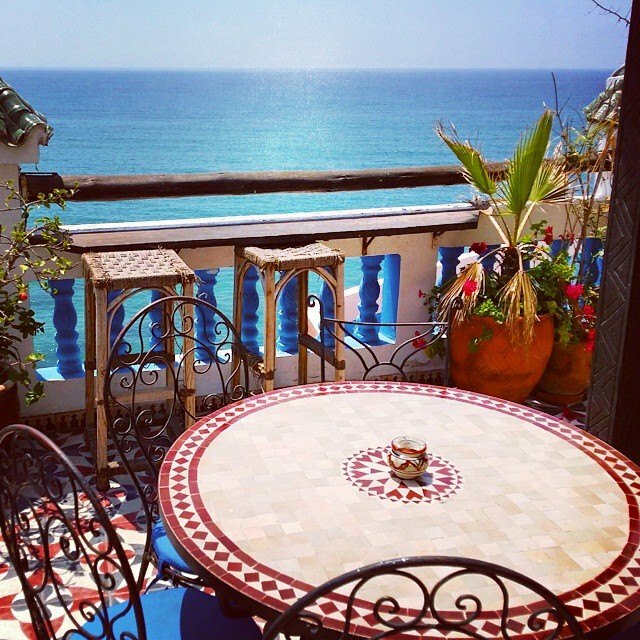 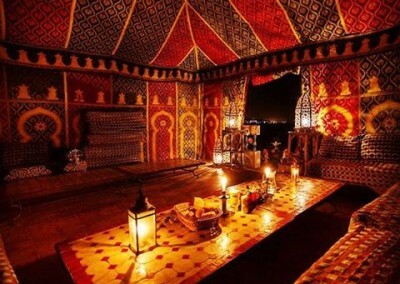 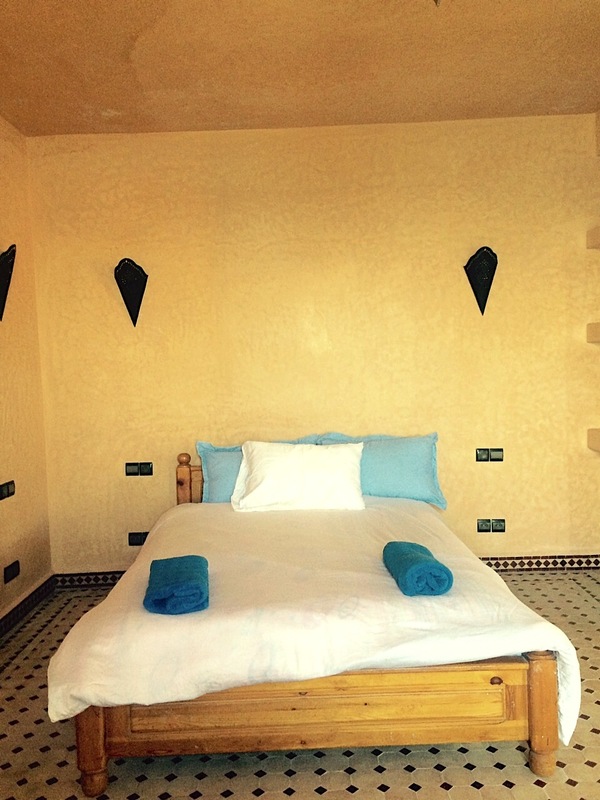 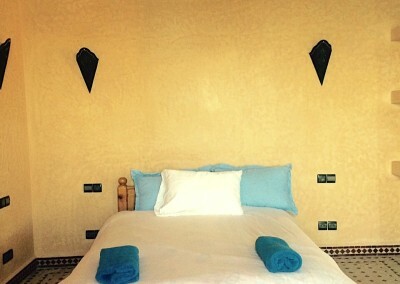 Ready to book in your next morocco surf trip? 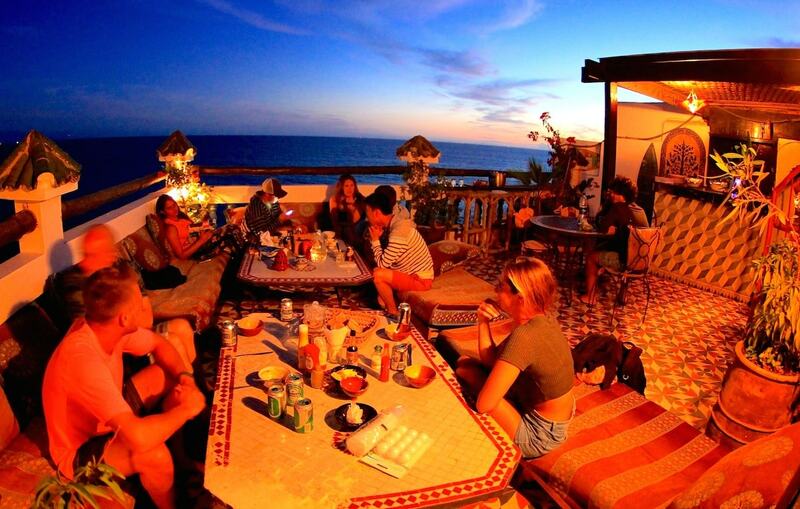 Just click the Book Now button below and you’ll see all the available holiday options for your dates.